Every weekend in October – you can have tons of fun at SeaWorld!! There will be an underwater fantasy, silly spooky shows, fun fishy crafts and lots of candy and trick-or-treat fun! All of this is free with your SeaWorld admission. ORLANDO, Fla. – (August 2012) – SeaWorld Orlando invites families to dive in and explore an underwater “fantasea” at SeaWorld’s Halloween Spooktacular. Lifetime memories are created during Central Florida’s ultimate family-friendly event where children can trick-or-treat, dance with fanciful sea creatures, and create sea-themed arts and crafts. Back and better than ever this year, SeaWorld’s Halloween Spooktacular returns with added trick-or-treat stations and even more colorful characters. 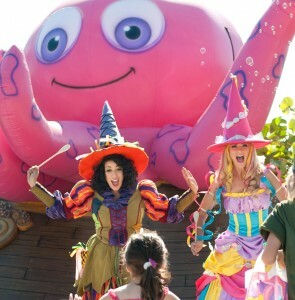 SeaWorld’s Halloween Spooktacular takes place every weekend in October: 6-7, 13-14, 19-21 and 26-28. This daytime event runs from 12 p.m. to 8 p.m., leaving the littlest of trick-or-treaters wide-eyed for the fun-filled activities. The best way to experience all of SeaWorld’s year-round events, as well as exclusive savings and perks, is with an Annual Pass. For more details or to purchase visit SeaWorldOrlando.com. We went last year and had a blast!! See our Spooktacular Halloween visit! You can dance and play games at Penelope’s Party Zone. Stock up on the candy at the Trick-or-Treating Under the Sea. There are different stations throughout the park. You can eat Carmel apples and chocolate covered rice crispies treats at the Sweet Treat Decorating station. This is not a sponsored post. Just wanted to share. This sounds like fun for the family. I did not know Sea World has a Halloween thing. Fun! I never knew they had a Halloween thing either.,. so fun! A holiday sleepover? NO WAY! Sounds so cool. Oooo — my kids would LOVE this. You guys do look like you had a lot of fun! We went last year, too! It was a lot of fun! I love your costumes last year!! So fun! OMG – you just woke me up – HALLOWEEN? Already? Still, it looks like a blast….but HALLOWEEN? yay it’s that time again! We love the Spooktacular! Oh this looks like so much fun! I have not been to see world for about 10 years! I just love it!!! So neat they are doing this for the kids! Wonder how many kids will dress up like Shamu??? I can barely believe it’s September, crazy that Halloween is so close. It sounds like a fun time! I’ve never been to SeaWorld during Halloween, I need to check it out!! This sounds a better day for my kids then Universal Halloween Horror night. I love Halloween it is my favorite holiday! i would love this! I have to put it on my list to do = maybe next year! This looks like so much fun, I wish we lived near an amusement park so we could do fun stuff like this! Ooh I wonder if the Sea World in San Antonio is doing something like this! What a fun family activity! Thanks for sharing! WIsh I was close to a Seaworld. Great that they shake things up with the Halloween theme. Must be a lot of fun! Oh my how much fun you guys look like you had!! Looks like a great time! Oh, how cute is this! Such great colors and fun for the whole family! 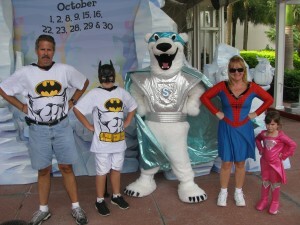 We love Sea World and Halloween, I had no idea that they collaborated to make a special event!